Detailed description: I entered the college and talked to the person behind the door, and received the find a way to enter the sealed quest. 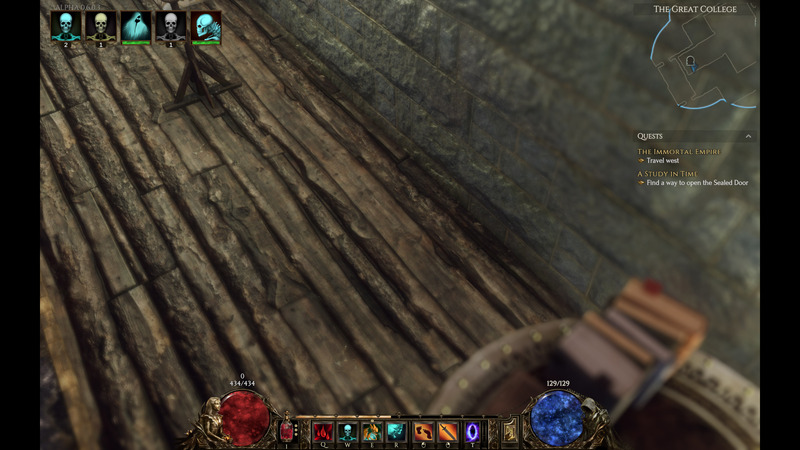 When I tried to exit back to Imperian Welryn I became stuck and could not move in or out of the door. I finally after a lot of clicking and zooming was just about to reset when I suddenly found myself outside the door but without any minions (I had 6 at the time). I then went back inside and of course the npc’s had regenerated. My minions were there and once again we killed them. I then went back to the sealed door and received the study in time quest again. When I tried this time to exit it worked ok except that once again my minions did not exit to imperial welryn with me. The screenshot was taken when I was stuck and it looks like I was somehow behind the door. This issue should be resolved in our next patch.